All of a sudden, religious issues have come to the forefront of Indian politics. Although the ruling Bharatiya Janata Party (BJP) is a coalition of factions ranging from pro-development, liberal economics positions to the Hindu Right (advocates of the Hindutva ideology), the party came to power on an explicitly pro-development platform. This is a platform that needs to be seriously addressed, because for all its progress, India has some major developmental problems, especially human developmental ones. While a dose of nationalism was overdue and welcome in Indian politics, certain factions of the BJP are seeing their party’s victory as a sign that it is time to push a hard-right religious agenda. This posturing by elements of the BJP, most of whom are also members of the Rashtriya Swayamsevak Sangh (RSS), a Hindu nationalist organization, risks torpedoing the BJP’s developmental agenda. Not only can the actions of the hard-right Hindu elements of the BJP lose it votes in the future and distract the party from pursuing a development agenda, they are already uniting all the opposition parties in India’s Parliament against it on unrelated, economic issues. This could also derail the BJP’s reform agenda; at the end of the year, it has not yet managed to pass a single major reform bill. A couple of weeks ago, a BJP minister, Sadhvi Niranjan Jyoti, gave a speech in which she appeared to describe non-Hindus as “bastards.” Such views are not new among some members of the BJP, but these members are now emboldened and believe that BJP electoral victories have given them a free hand to pursue their agenda of asserting the dominance of their variation of Hinduism. Increased Hindu conversions of non-Hindus is an issue that has become increasingly prominent and controversial lately, spurred by a recent incident in the city of Agra where 200 Muslims were mass converted to Hinduism. Some later alleged that they did not know they were being converted and implied that their conversion was coerced. Hindu groups claim (often correctly) that the mass conversion of non-Hindus is a practice no different from Muslim and Christian groups luring poor Hindus into converting to Islam or Christianity. Additional claims are made by Hindu groups (often correctly again) that Hindu-facilitated mass conversions of non-Hindus are merely responses to conversions away from Hinduism. 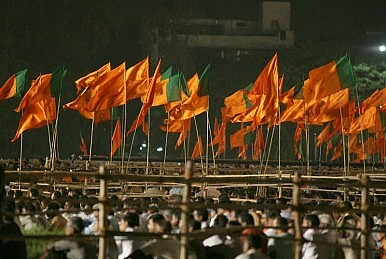 Hindu groups have supported anti-conversion laws in several Indian states, to the protests of Muslims and Christians. It is not really relevant as to who has the right or wrong of the matter with regard to conversions in India. Yes, Muslim and Christian evangelical groups often use shady tactics to get converts, but so do many hardline Hindu groups. But the concept of mass conversions and converting through such a large, communal event is rather backwards. In countries like the United States, individuals convert and change religions quite often but mass, public conversions, which are really spectacles, are rare. It is really nobody’s business what religion their neighbor or anyone else follows and the energies of the people of India ought to be used for more useful goals rather than going around and mass-converting people.